EDITOR’S NOTE: Updated at 8:30 a.m. EST (1330 GMT) Nov. 11 after scrubbed launch attempt. 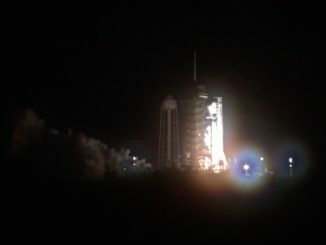 The rocket’s two RD-181 engines will ignite around 3.6 seconds before liftoff from pad 0A at the Mid-Atlantic Regional Spaceport, a complex owned by the state of Virginia at NASA’s Wallops Flight Facility. Launch is timed for 7:14 a.m. EST (1214 GMT) Saturday. The first stage’s two RD-181 engines will power up to 864,000 pounds of thrust and burn for 3 minutes, 35 seconds to accelerate the rocket to more than 8,750 mph (3.9 kilometers per second) and an altitude of 61 miles (99 kilometers), then separate from the upper stage’s Castor 30XL motor about six seconds later. 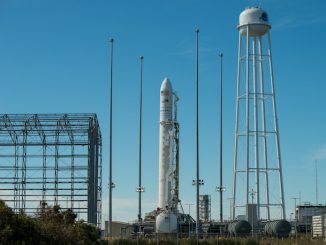 The launch, known as OA-8 in Orbital ATK’s station resupply manifest, will be the second Antares mission using RD-181 engines, which the company ordered from the Russian engine-builder NPO Energomash to replace decades-old Russian-built AJ26 engines blamed for an Antares rocket crash seconds after liftoff in October 2014. The RD-181 engines performed better than predicted on an Antares launch in October 2016, giving engineers confidence to loosen performance limits for the OA-8 launch. The engines produce more thrust than the AJ26s, and they will be programmed to fire around six seconds longer on the OA-8 launch than on the last Antares flight. Once the first stage finished its job on the OA-8 launch the Antares rocket’s 12.8-foot-diameter (3.9-meter) diameter payload shroud will jettison in two halves at T+plus 4 minutes, 11 seconds. An interstage adapter that connected the first and second stages will separate at T+plus 4 minutes, 16 seconds. The launcher’s Castor 30XL solid-fueled upper stage will ignite at T+plus 4 minutes, 24 seconds, and generate up to 104,300 pounds of thrust during a burn lasting 2 minutes, 42 seconds. 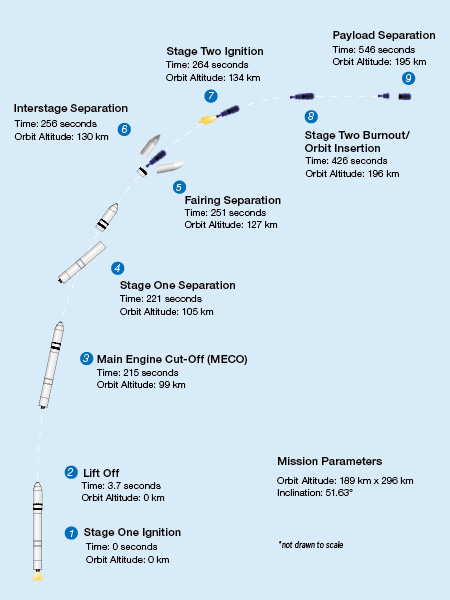 The second stage motor will burn out at T+plus 7 minutes, 6 seconds, then deploy the Cygnus spacecraft at T+plus 9 minutes, 6 seconds. 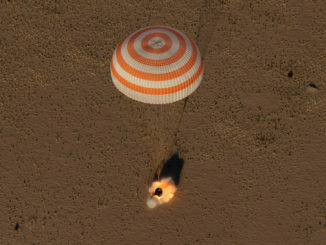 The spacecraft’s two cymbal-shaped electricity-generating solar arrays will unfurl in a fan-like motion around 90 minutes into the mission, and the ship’s thrusters will begin fine-tuning its approach to the space station with a series of course-correction burns Sunday and Monday, setting up for a laser-guided final approach Tuesday.